Leeds Rhinos secured their Super League status despite losing 16-17 to Toronto Wolfpack in the final match of the 2018 season. Both sides came into the game knowing that it was still all to play for. After a win against Halifax last weekend, Leeds would secure their place in the Super League as long as they avoided a 32-point defeat against the visitors from Canada. 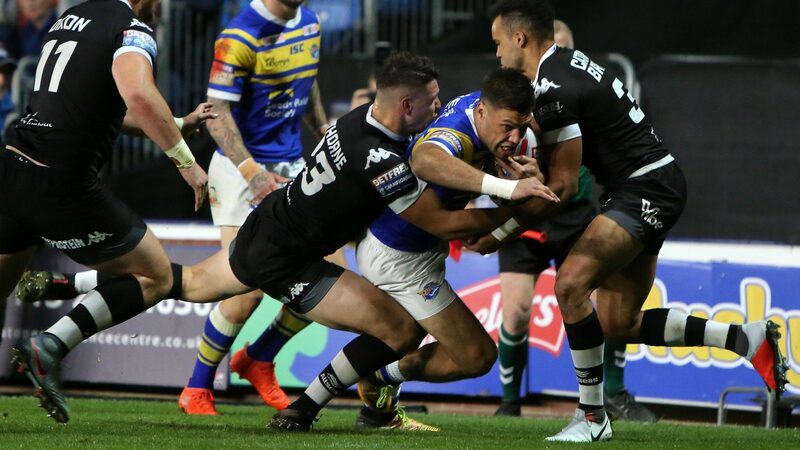 A mistake from the kick-off gave Toronto their first set of six tackles just 10 metres from the try line but Leeds’s defence stood strong and weathered the storm. However, just moments later the visitors thought they’d scored but the video referee ruled the try out as Mason Canton-Brown didn’t quite put the ball down. The Rhinos continued to rack up the penalties and Toronto made them pay. After a strong hand-off from Gareth O’Brien, he ran at Ashton Golding and found Cory Patterson on the underlap to score the first try of the game. O’Brien added the extras and put Toronto 0-6 up. Leeds didn’t have to wait long to score themselves but not without a video review from Phil Bentham. After a number of offloads, the ball found its way through to Liam Sutcliffe and his grubber kick was perfectly weighted for Tom Briscoe to collect and touch down in the right corner. Sutcliffe couldn’t convert the tough kick but the deficit was reduced to 2 points. Midway through the first half, O’Brien pushed that deficit back out to 4 points when he converted a penalty from in front of the posts. However, The Rhinos levelled the game when Liam Sutcliffe scored underneath the sticks. A chipped kick from Richie Myler was picked out of the sky by Sutcliffe and he gratefully placed the ball down unchallenged. Sutcliffe then converted his own try and gave Leeds a 10-8 lead. The lead changed hands once more as a try with just 3 seconds remaining in the first half put the visitors back in front. Toronto began to build pressure and after some crazy offloads, Nick Rawsthorne found himself with the ball in his hands and he dived over to score. O’Brien couldn’t complete the conversion so the half finished with Leeds trailing 10-12. Both sides had chances to score early in the second half but the most notable was when Andy Ackers was held up for the visitors. The Wolfpack did eventually get over the line but once again video referee Phil Bentham was called into action. Bentham again disallowed the try as he judged a man wearing blue and amber to have touched the ball down first. The Rhinos then went right down the field and scored. Jimmy Keinhorst was able to somehow get the ball free from the tackle and superbly touch the ball down over the try line. Sutcliffe was on hand to convert the try and give Leeds a 16-12 lead. Toronto scored in the left corner through Matty Russell to level the game at 16 each. O’Brien failed to convert the try so it set up a frantic final 15 minutes of action. Dom Crosby was sent to the sin bin and 12-man Leeds had to somehow keep Toronto from scoring. They managed to keep the visitors scoreless for 8 minutes but it wasn’t for lack of trying from The Wolfpack. Gareth O’Brien missed a drop goal and then the same fate awaited Richie Myler down the other end of the pitch. O’Brien managed to complete a drop goal at the second time of asking to put his side up by 1-point with 4 minutes remaining. A drop goal attempt from Joel Moon in the final seconds went wide of the uprights so Toronto finished the game 16-17 winners and will have to wait on results elsewhere to find out if they will have a guaranteed place in the Super League next season.